The next step is to reduce as much as possible the common causes of variation so the output of the process is centered on the mean. In day 9 we can see a special cause of variation. The output is out of the control limit, so this defects doesn’t come from a common cause. It should be investigated why this day so these defects were obtained. What had changed in the production process from that day compared with the others (material, machine settings,??). We can also see that on day 3 the obtained results were nearly out of control as well, a worse as normal performance. In order to improve the quality, CPM aims to control the process, and look for ways of solving the variability of the output. Solutions must be gathered to reduce the wide range of ring dimensions obtained in days 1 and 10. For the management of the company would be interesting to take a look at some other details for reducing variability. The biggest variability has been given by days 1 and 10, with differences up to 40 cm in the ring diameters. The best producing days have been days 5 and 6, where the precision has been very good in average, and the variability small along the day. 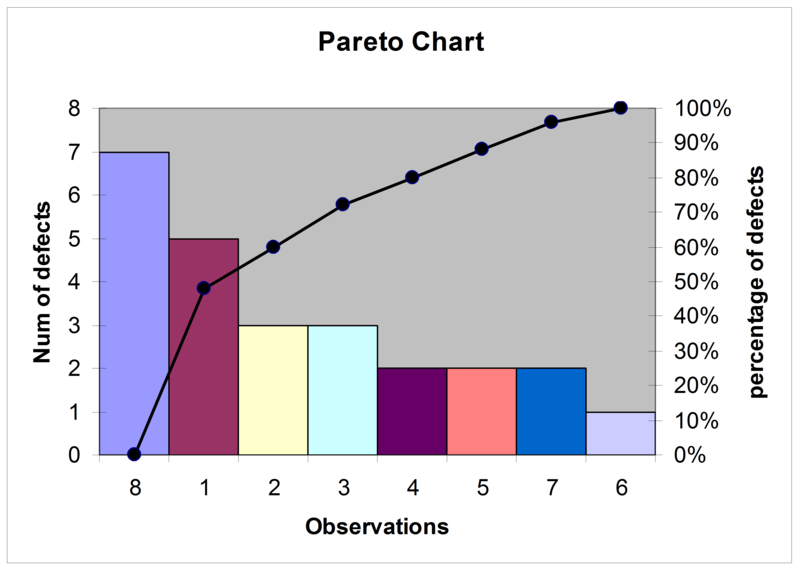 Pareto Chart with the number of errors along the different observation times. The date from this check sheet is diverse. At the first glance no trend can be identified, repetition patron, or main defect source. Depending on the day one different type of defect is leading the chart. 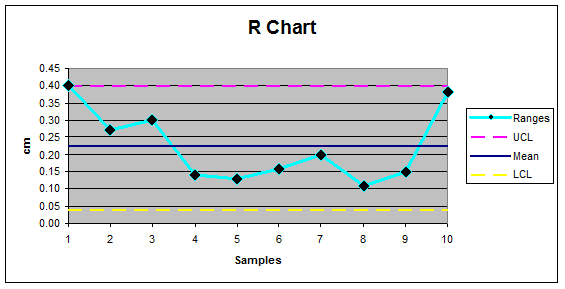 To have a better view, and try to see any trend the data will be shown in a Histogram. With the help of the histogram, can be seen that the day with less errors is clearly day 7. But is not well related with one type of errror or another. It doesn’t seems to have any relationship or cause-efect conditions. While some defects are reduced along the week, some others increase suddenly in the middle of the week. Other errors appear and disappear in alternate days. 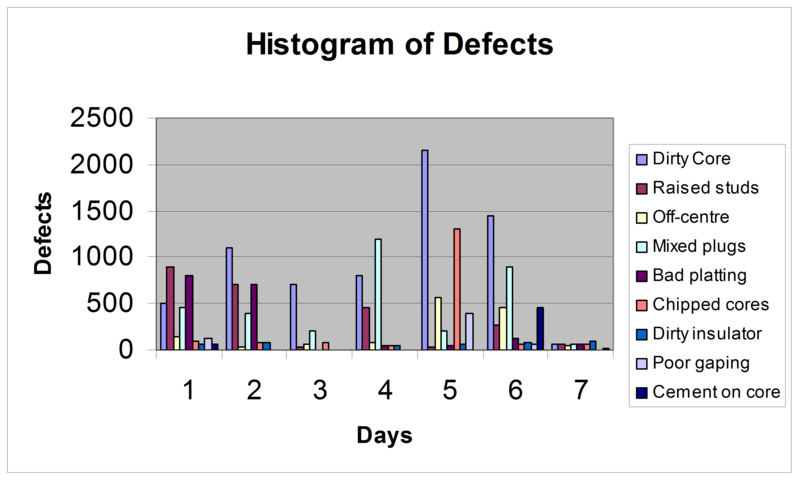 Histogram of the total number of defects by day of the week. From the first graph has been identified that the number of errors for some type of defects has great variabilities. For example, Dirty Core varies in a range from 2150 to 60 errors depending on the day. Chipped Core has a range of 1255 errors from one day to another. While Dirty Insulator has the same pressence along the 7 days. 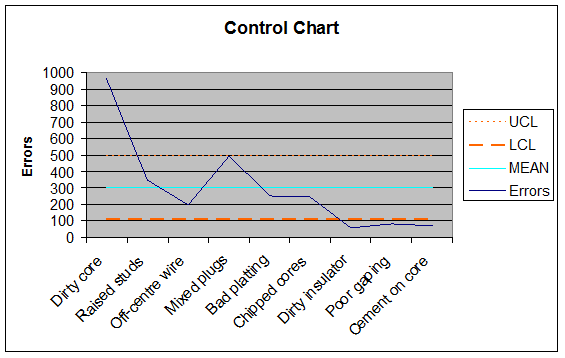 By using Control Charts alows to see the average number of errors and the impact of each type of defect. It can be seen which processes gives the expected number of errors, and which type of defects is out of control, returning more errors than expected. In this control chart it is identified tat Dirty Core is out of control. In the other hand, Dirty Insulator and Poor Gaping are appearing less than expected. 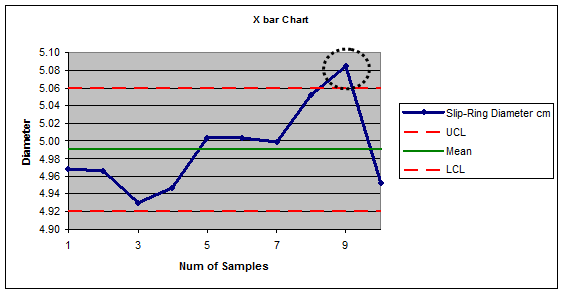 Variability Chart is is useful to see which defects are appearing regularly in the process. It gives information as well as the range of the number of defects. The first thing to get under control the defects Dirty Core and Dirty Insulator. One because of the big number of defects and variability, and the other for the other side. By doing so, the process can start being improved, and forecast and butdgets can be reliable. 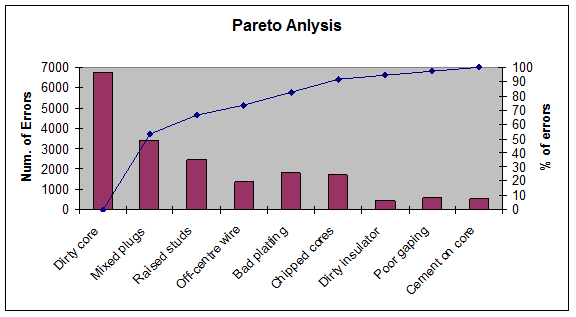 Pareto análisis for identifying the main defect sources.